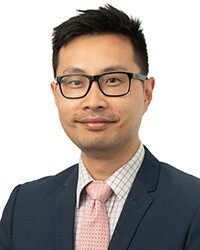 Mr. Damien Loh is an Upper Gastrointestinal and General Surgeon, specialising in surgery for disorders of the stomach and oesophagus, and weight loss surgery. He obtained his medical degree from the University of Melbourne and gained his Fellowship in General Surgery in 2012. He subsequently undertook a further three years of specialty training in Upper Gastrointestinal and Bariatric (weight loss) Surgery at various specialist centres around Australia. He currently works as an Upper Gastrointestinal Surgeon at The Alfred, and a General Surgeon at The Northern Hospital. Mr. Loh has published in several local and international journals, and presented at local and international meetings and conferences. He has been actively involved in teaching and mentorship of surgical colleagues and allied health staff throughout his career. He is currently a Faculty Instructor of the surgical skills and techniques (ASSET) course at the Royal Australasian College of Surgeons. Mr. Loh is a member of the Australia and New Zealand Gastric and Oesophageal Association (ANZGOSA) and the Obesity Surgery Society of Australia and New Zealand (OSSANZ). He was previously a Conjoint Lecturer at the University of Notre Dame in Sydney. Mr. Loh is committed to providing the highest quality surgical service to the community and believes in a thorough, collaborative approach to providing the best possible treatment for your condition.